Trombone Shorty: A Young Torchbearer Lights The Way For New Orleans Music Students At 27, bandleader Trombone Shorty is already an icon in his hometown. So he's giving back: Through his own foundation, the "supafunkrock" brass player is nurturing even younger talent in local schools. Trombone Shorty, aka Troy Andrews, has started a foundation dedicated to music education in New Orleans. In New Orleans, it's cool to be in the high school band — especially when Trombone Shorty shows up in the band room. The brass player and bandleader recently paid a visit to New Orleans' Warren Easton High School to work with band members. It's part of his work with the Trombone Shorty Foundation, a music education initiative. 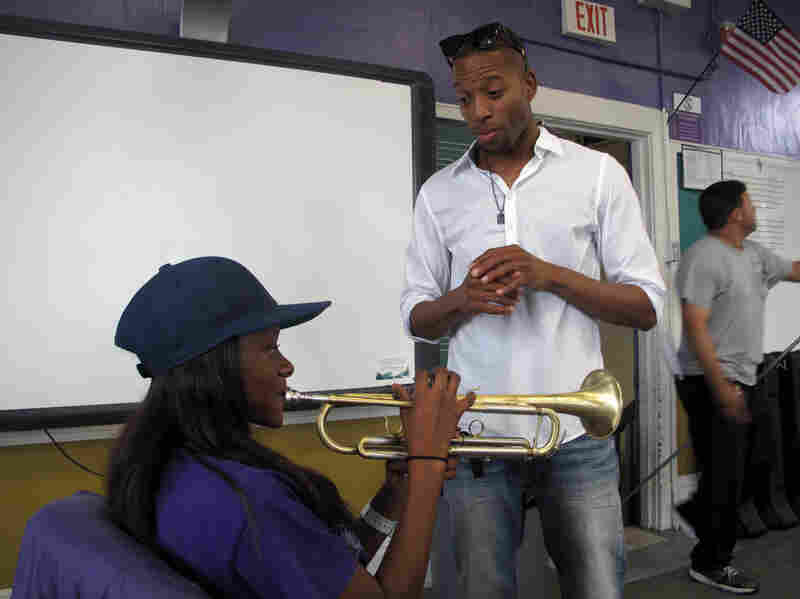 "[Trombone Shorty] is, without a doubt, the role model for the next generation right now," says Bill Taylor, the foundation's executive director. In the school's hallway, Taylor explains that the Trombone Shorty Foundation teams up with Tulane University to give promising young musicians a deeper skill set. "New Orleans is filled with a lot of musical talent," Taylor says. "Sometimes the opportunities are lacking to take it to the next level. [Trombone Shorty] is an example of a musician — there are many over the years, Harry Connick [Jr.], the Marsalises — that have really broken through to that next level." 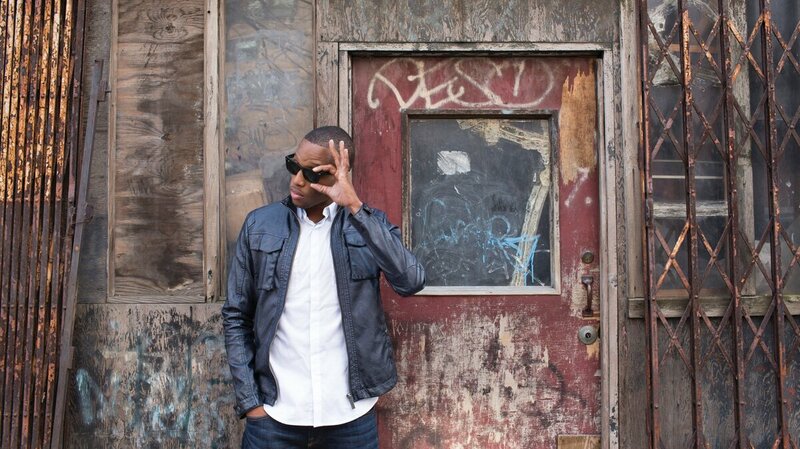 The new record from Trombone Shorty, now 27, is in the Top 5 on Billboard's jazz chart. But it's hard to confine Say That to Say This to any one genre: The album takes a romp from rock and funk to jazz and soul, all rooted in the styles of his native New Orleans. Now Shorty, born Troy Andrews, is trying to keep the New Orleans sound evolving by engaging the city's young talent. Andrews grew up in New Orleans' Tremé neighborhood, surrounded by musicians. His older brother James is a noted trumpet player and bandleader. His grandfather Jesse Hill was an R&B singer known for the New Orleans classic "Ooh Poo Pah Doo." From the time he was about 4, Andrews was playing trumpet and trombone in the streets and onstage with icons like Bo Diddley, Dr. John and The Neville Brothers. By age 18, he was on tour backing Lenny Kravitz. Trombone Shorty explains breathing technique to trumpet student Jazz Henry, a junior in the Warren Easton marching band. Say That To Say This, his third major solo album, pays homage to all those influences — in the local vernacular.
" 'Say that to say this' — it's basically what we say in New Orleans," he says. "If you talking to somebody and in the middle of the conversation they say, 'I say that to say this,' it's just basically making a long story short. And I just wanted to make a long story short — put as much music as I can in a compact situation like that." Andrews likens the different styles on the record to the slang you might pick up in different neighborhoods. And he has a name for it: "supafunkrock." "But we just going to let it be music, you know," he says. "The music is so New Orleans, we don't know what to call it. It's just New Orleans music. The same way we live here, you know. Food — got gumbo, got red beans. Some type of way some of that stuff meet up on the same plate. And that's what we do. We just leave it open." Trombone Shorty pulled off a bit of a local miracle by reuniting legendary funk band The Meters. He got the group together in the studio for the first time since 1977 for a cover of its single "Be My Lady." "I think The Meters are like The Beatles to us in New Orleans, you know," Andrews says. "So to be able to pull that off and have them mutually excited and for them to come together for that, it was just a dream come true for me." Trombone Shorty replaced The Neville Brothers as the traditional closing act at the New Orleans Jazz and Heritage Fest this year. It's a symbolic passing of the torch — festival producer Quint Davis noted the move by declaring that "the future is now." Though he's been saturated in the local music scene since birth, Andrews' versatility and technique were honed in his high school days at the New Orleans Center for Creative Arts — the local performing-arts magnet high school. There, he teamed with some of the players in his Orleans Avenue band. That's part of his motivation to work with aspiring musicians today. Between sessions with the Warren Easton band, he encourages individual students to form their own bands and stretch themselves by sitting in with a Latin or R&B group. Saxophone player Jasmine Batiste was excited to tell him what she'd learned at a recent jazz camp. "It was talking about Jelly Roll Morton, Louis Armstrong, Bessie Smith and all those people ... from the early part of jazz and going right up," Batiste says. "You always want to learn, you know," Andrews replies. "But I think what some of us get caught at is we learn about those people and we get obsessed with what they're doing, and we try to re-create that. And that's when everything stops." Use the early players like a dictionary, he tells the students, but find your own sound and push it forward.